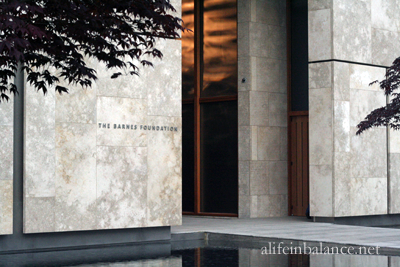 This past weekend, the Barnes Foundation newly located on the Parkway in Philadelphia was open for free for 56 consecutive hours. The catch was you had to reserve the tickets several months ahead of time, and gallery tours were only an hour long. I reserved 2 children’s tickets and 1 adult figuring I would decide later which children were going. Unfortunately, the Barnes had some ticketing issues on Friday which generated quite a few negative comments on their Facebook page. Somehow, it seemed to me this was part of the Barnes mystique and desire to keep the collection open to only a few visitors at a time. After reading the comments and not knowing what the building would be like, I decided to take only my daughter for some girl time. This turned out to be the perfect choice. 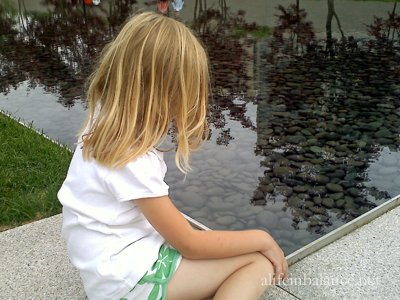 Both of us loved the pools flanking the walkway into the Barnes. Unfortunately, I couldn’t take pictures inside the building to share the amazing mix of modern design blending with the style of the Merion Campus of the Barnes Foundation. The new building is built around a replica of the Merion Campus galleries. Our tickets were for 8 a.m., but when we arrived we found that all those tickets were already taken. While we waited for the 9 a.m. tour, we walked around the inside of the building checking out the gift shop and the indoor garden. Unfortunately our 9 a.m. tour didn’t start until 9:10 to 9:15, and we were ushered out of the galleries by 10 a.m. Yes, the tickets were free, though this type of poor planning on the part of the Barnes Foundation creates poor public relations. After our tour, we stopped by the local Starbucks and grabbed some snacks. We sat near the gazing pool at the entrance and watched the people. All in all, it was a wonderful morning out with my daughter. We’re already talking about visiting the Philadelphia Art Museum together. 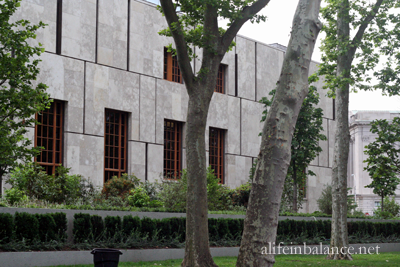 I personally love the Modern Art Gallery, and I’d like to visit the Rodin Museum which is just up the street from the Barnes Foundation. Sounds like a great time. It does sound poorly handled though. At least you were prepared for that. I would love to take my daughter to the Philly Museum ofArt. I used to go all the time when I was in college and they had free student Sundays. The funny thing is she has been to most of the NYC museums already and some even twice. You’d think we’d have taken her to what is local. We’ve taken her to the Guggenheim and the Metropolitan Museum of Art twice and the Museum of Natural History once. Now we need to do MoMA. Heather recently posted..Happy Birthday, Boys!!! I think it was a shame that it was poorly handled though the staff and the security guards were so friendly and helpful. I guess it’s part of the Barnes heritage! Stopping by from the Saturday SITS sharefest. What a good post about spending time with your daughter. I think as moms we often forget how important that one-on-one time can be! I am sorry to hear about the debacle of the visit to the foundation, though, as that sounds very frustrating. Your daughter is adorable, by the way! thedoseofreality recently posted..The Dose of Reality’s Summer Reading GIVEAWAY! Thank you for the compliment! It was a bit frustrating, and we did fine. I hope they get the kinks worked out.